This discovery has led to new insight into how stars evolve. The discovery, published in the latest edition of the journal Nature and made possible by observations using NASA's powerful Kepler space telescope, is shedding new light on the evolution of stars, including our own sun. 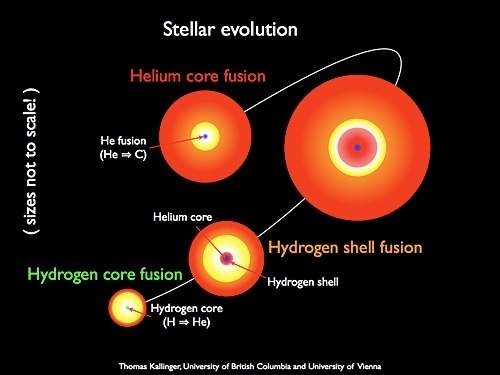 The paper's lead author, the University of Sydney's Professor Tim Bedding, explains that "red giants are evolved stars that have exhausted the supply of hydrogen in their cores that powers nuclear fusion, and instead burn hydrogen in a surrounding shell. Towards the end of their lives, red giants begin burning the helium in their cores." The Kepler space telescope has allowed Professor Bedding and colleagues to continuously study star light from hundreds of red giants at an unprecedented level of precision for nearly a year, giving a window into the stars' cores. "The changes in brightness at a star's surface is a result of turbulent motions inside that cause continuous star-quakes, creating sound waves that travel down through the interior and back to the surface," Professor Bedding said. "Under the right conditions, these waves interact with other waves trapped inside the star's helium core. It is these 'mixed' oscillation modes that are the key to understanding a star's particular life stage. By carefully measuring very subtle features of the oscillations in a star's brightness we can see that some stars have run out of hydrogen in the centre and are now burning helium, and therefore at a later stage of life." Astronomer Travis Metcalfe of the US National Center for Atmospheric Research, in a companion piece in the same Nature issue which highlights the discovery's significance, compares red giants to Hollywood stars, whose age is not always obvious from the surface. "During certain phases in a star's life, its size and brightness are remarkably constant, even while profound transformations are taking place deep inside." Professor Bedding and his colleagues work in an emerging field called asteroseismology. "In the same way that geologists use earthquakes to explore Earth's interior, we use star quakes to explore the internal structure of stars," he explained. Professor Bedding said: "We are very excited about the results. We had some idea from theoretical models that these subtle oscillation patterns would be there, but this confirms our models. It allows us to tell red giants apart, and we will be able to compare the fraction of stars that are at the different stages of evolution in a way that we couldn't before." Daniel Huber, a PhD student working with Professor Bedding, added: "This shows how wonderful the Kepler satellite really is. The main aim of the telescope was to find Earth-sized planets that could be habitable, but it has also provided us with a great opportunity to improve our understanding of stars."